The latest large expansion to hit Amsterdam is Nieuw-Sloten, sited in a former horticultural area between the western garden suburbs, laid out in accordance with C. van Eesteren's General Extension Plan, and the village of Sloten. This new district ranges 5,000 houses around a nucleus of shops and offices. The formal backbone of the design is a central axis containing the major traffic route, rapid tramline and services, and marked by tall development. The district divides into fourteen sectors each fleshed out by an architect within certain planning constraints and coloured by experiments in low-rise high-density development. 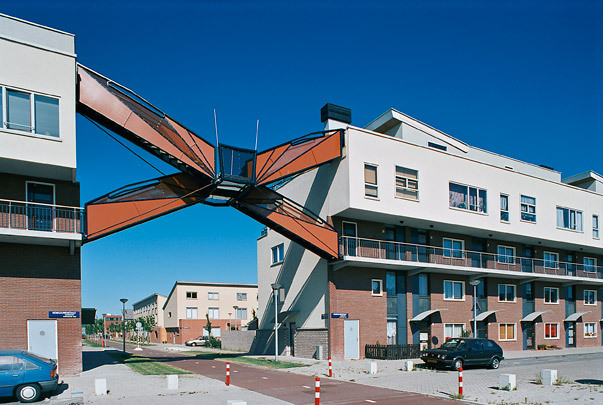 Street furniture and bridges (by Zwarts & Jansma) are key elements in bringing unity to Nieuw-Sloten. The district is less a distinctive urban plan than an assemblage of projects of varying success. One compelling example is the district centre, designed by Atelier pro and dominated by three oval towers eight and sixteen storeys high. Here too are a pair of housing blocks designed by the 'grand old men' of the Dutch Modern Movement, J.P. Kloos and A. Bodon. Uytenhaak's project experiments with a special type of brick. In it tall blocks enfold a central section mainly of 'court-houses'. True to form, Soeters' dwellings teeter on the border between art and kitsch. Opposite them are 'water-villas' which, along with Gunnar Daan's residential blocks and the 'Eilandenrijk', forge a link with the old village of Sloten. Each of the eight islands comprising Eilandenrijk has its own bridge to the mainland; the houses on them were designed by seven woman architects.